A new national and European system, giving patients further protection from the threat of counterfeit medicines comes into effect tomorrow (Saturday 9th February 2019). Throughout Europe, medicine packs will have enhanced tamper-proof measures and will now carry a barcode with a unique serial number so that each pack can be scanned in a pharmacy. It will be checked against a central database to ensure the product is legitimate before handover to a patient. Established and managed by the Irish Medicines Verification Organisation (IMVO), the new national system provides an additional layer of security to protect the supply of medicines at pharmacy and patient level. Ireland is now in compliance with the EU Falsified Medicines Directive (FMD), which provides more safeguards and security to ensure Irish patients will continue to have absolute confidence in the medicines they receive from their pharmacy. According to Pat O’Mahony, Chair, IMVO, “Setting up this advanced and robust verification system is a significant undertaking as a result of over three years of collaboration by the key Irish stakeholders including pharmaceutical manufacturers, parallel distributors, wholesalers as well as community and hospital pharmacists. Substantial work and investment has been required by everyone in the medicines supply chain to have the system up and running and in place as appropriate to the legislation coming into effect. 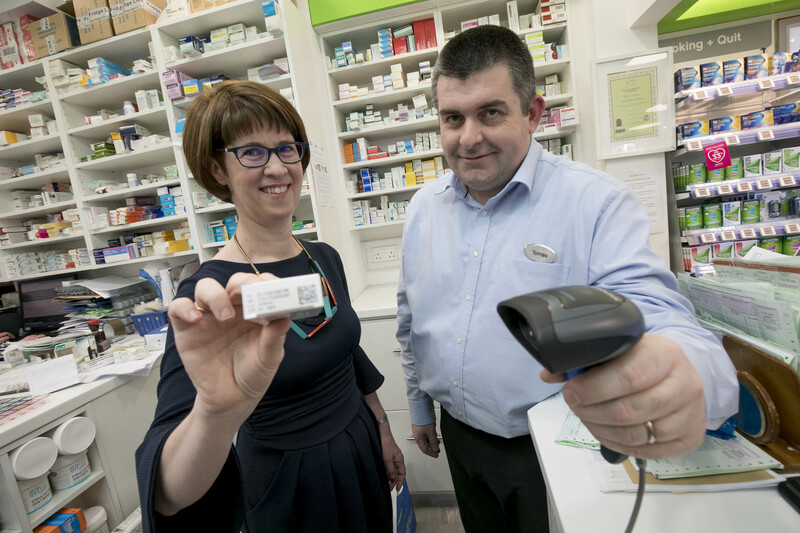 “Although there has been no risk or reported incidents at pharmacy level from counterfeit or falsified medicines in Ireland, other countries have had issues so this new system provides further security and protection for Irish patients now and into the future. Counterfeit medicines can pose serious risks to health, as there is no guarantee of their quality or safety,” he says. 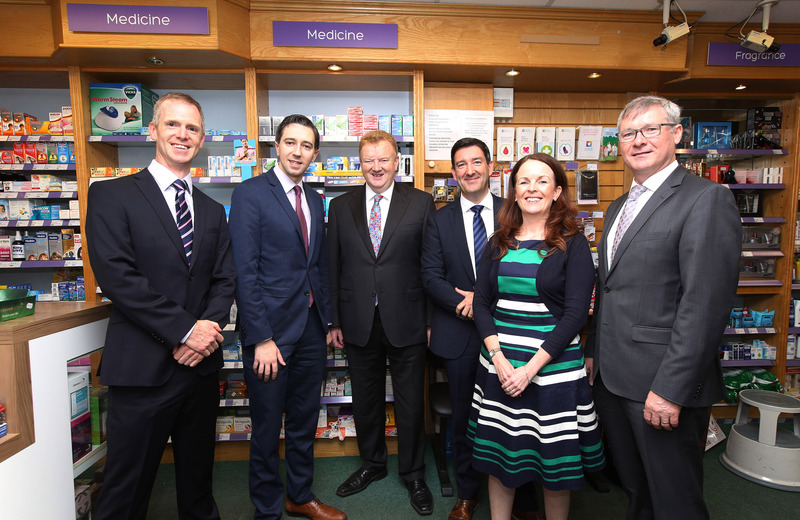 The initiative has involved the collaboration of over 2,000 pharmacies, hospitals and wholesalers in Ireland who distribute dispense over 95 million prescription medicines every year, as well as the manufacturers who make the products. Each pharmacy now has a scanner to check each pack before it is dispensed to the patient. The scanner connects to a central database of prescription-only medicines manufactured, distributed and supplied for sale in Ireland. Anti-tamper device to provide assurances that the pack has not been interfered with, e.g. glued flap, sticky seal, plastic break-seal. The system is based on providing an alert if the barcode is not identified when scanned. A clear protocol then follows to investigate these alerts, involving the location where the pack was scanned, the manufacturer, the Health Products Regulatory Authority (HPRA), the IMVO and its European counterpart, the European Medicines Verification Organisation (EMVO). For the next number of months, medicine packs with and without the individual serial number will be available at the same time as the existing stocks are gradually replaced by new packs with safety features. There is also a period of time allowed to bed in the new system across the country so alerts will be monitored and managed without any impact on medicine supply during this ‘use and learn’ phase. IMVO advises that purchasing prescription-only medicines from the internet or other unauthorised sources is illegal and there is a high risk that these products are counterfeit, not safe for use, and do not contain the active ingredient required to make the medicine work. When you receive medicines from your pharmacist, always listen to their advice and follow the steps outlined in the package leaflet. Association of Pharmaceutical Parallel Distributors (www.aippd.ie) which represents active parallel importers in Ireland. Irish Pharmaceutical Healthcare Association (www.ipha.ie) which represents the international research-based pharmaceutical industry in Ireland. Irish Pharmacy Union (www.ipu.ie) which is the representative and professional body for community pharmacists in Ireland. Medicines for Ireland (www.medicinesforireland.ie) which represents Irish-based manufacturers and suppliers of generic OTC, biosimilars and hybrid medicines. IMVO has worked extensively over the last three years with the relevant State organisations to ensure a successful system is in place. This includes close collaboration with the Department of Health, the Health Products Regulatory Authority (HPRA), the Pharmaceutical Society of Ireland (PSI) and the Health Service Executive (HSE). There has also been extensive collaboration with the European Medicines Verification Organisation (EMVO) and other national medicines verification organisations to ensure that the system across Europe is ready for the 9th February deadline. This new initiative is part of the European Commission’s Delegated Regulation (EU) 2016/161 on Safety Features on Medicinal Products for Human Use. The Delegated Regulation supplements the Falsified Medicines Directive 2011/161/EU, by setting out detailed rules for the safety features appearing on the packaging of medicinal products for human use. IMVO is part of a European-wide network of national medicines verification organisations, all operating national databases connected together via an EU Hub managed by the European Medicines Verification Organisation. This advanced and robust verification system ultimately captures the data of all medicines legitimately manufactured and supplied across Europe. Counterfeit medicinal products are now officially known as ‘falsified medicinal products’ under EU medicines legislation. Falsified medicines may contain ingredients which are of poor quality or in the wrong dose. 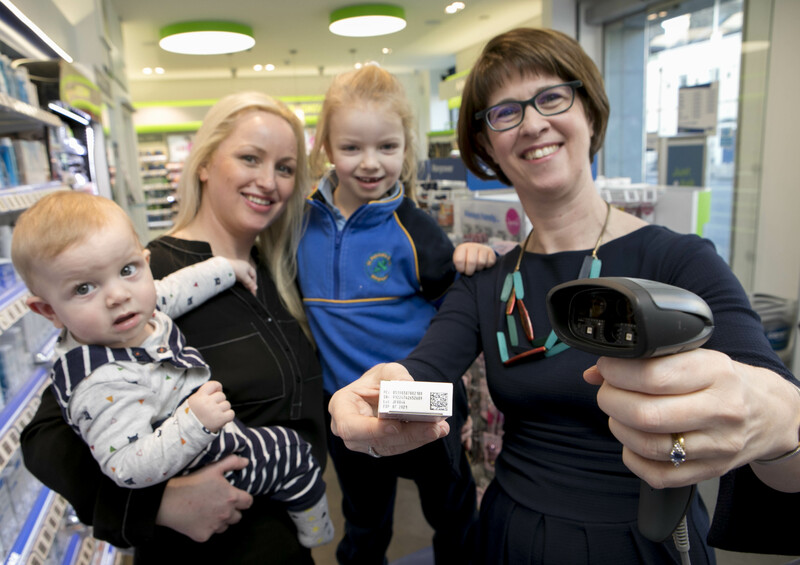 Pictured using the new system at Conefrey’s Care Plus Pharmacy, Pearse Street, Dublin 2, are Amy Brophy and her children Amelia and Tommy Andrews, Leonie Clarke, General Manager IMVO and pharmacist Tomás Conefrey. All medicinal products released by MAHs for the Irish Market after Feb 9th should bear the safety features as required i.e. a tamper proof seal and 2D barcode. All alerts generated by FMD system in pharmacies, wholesalers and hospitals, upon scanning a pack during this ‘use and learn’ phase will be forwarded by the system to the IMVO, the HPRA and the pharmaceutical companies so that they can be investigated and monitored. National legislation including the provisions of Article 23 of the Delegated Regulation will be introduced, however, the offences provided for in the Regulations will not be commenced for a period of time to let the new system bed in. During this period, the alerts generated will be analysed by the Department of Health, IMVO, HPRA, PSI, HSE and the private hospital pharmacies to determine why they are occurring and develop appropriate protocols for their resolution. Manufacturers (and marketing authorisation holders (MAHs) will also be involved in the investigation of alerts generated against their products. The system will be reviewed again in three months’ time. This approach will ensure that medicines continue to be provided to patients without delay and also ensure that all stakeholders, manufacturers, wholesalers, pharmacists and other healthcare professionals work to build confidence in operating the new safety system. Formal notification of this agreed national approach has been issued today to pharmacists, wholesalers, MAHs and manufacturers by the PSI and the HPRA. IMVO is very appreciative of the careful consideration given to the matter by the authorities in Ireland and we will continue to work closely with them over the coming months to maximise the learnings about the system during this ‘use and learn’ period. IMVO is delighted to announce that online registration for pharmacies and hospitals is now open. This is an important milestone to assist pharmacies and hospitals in complying with new EU Falsified Medicines Directive (‘FMD’) requirements that come into effect on 9th February 2019. IMVO has contacted all community pharmacies and hospitals registered with the Pharmaceutical Society of Ireland with details of how to register. Registering with IMVO is a pre-requisite for connecting the system that community pharmacies and hospitals will use to scan barcodes, to the IMVO repository. For more information, include HSE updates, visit our pharmacies & hospitals page. Wholesaler registration will commence shortly and wholesalers will receive a separate notification from IMVO. 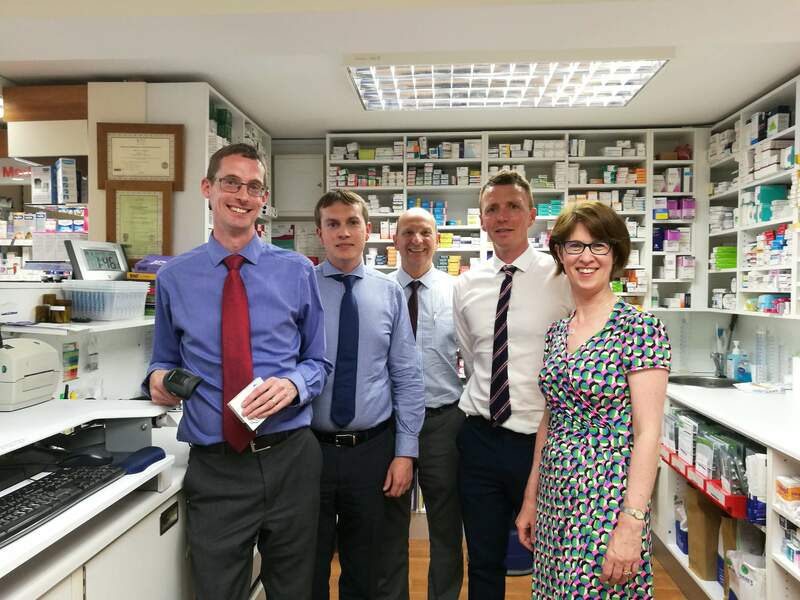 We are delighted to announce that the first serialised pack was decommissioned in Ireland in Moore’s Pharmacy in Crumlin, Dublin, on 20th June. We believe this may have been the first pack decommissioned in a community pharmacy anywhere in Europe using the ‘blueprint’ system model . The pack scanned was a J&J product and the system used was ezFMD provided by HE Clissmann. We are delighted to announce that the first serialised pack was verified in Ireland by PCO Manufacturing on 30th May, using their wholesaler connection to the Irish Medicines Verification System and the EasyFMD system supplied by Quick Pharm Solutions. Ireland was amongst the first five countries in Europe to start scanning of serialised packs using a live connection to the national medicines verification system. We are delighted to announce that the Irish Medicines Verification System (IMVS) has been connected today to the production environment of the EU Hub. Reaching this important milestone means that IMVO can start its pilot and thus the implementation of the IT system to support the safety feature provisions of the EU Falsified Medicines Directive. Together with Germany, Slovenia, Denmark and Sweden, Ireland is among the first countries to go live in Europe. 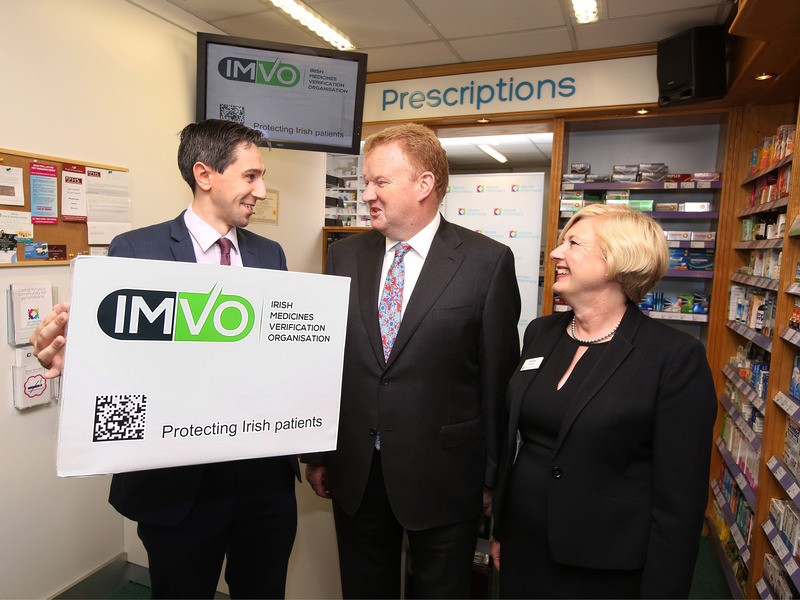 Pictured at the launch of IMVO was Minister for Health, Simon Harris TD with Professor Pat O’Mahony, Chairperson IMVO and Karene Moynan, managing pharmacist, Roche’s Allcare Pharmacy, Greystones. A unique new not-for-profit organisation – the Irish Medicines Verification Organisation (IMVO) - has been established by the key players in the medicines supply chain in Ireland - pharmaceutical manufacturers, wholesalers, parallel distributors, and community pharmacists - as part of an EU-wide series of measures to tackle the growing problem of fake or ‘falsified’ medicines. To set the problem in context, over 650,000 dosage units of falsified and other illegal medicines bought over the Internet were detained coming into Ireland in 2016, according to the Health Products Regulatory Authority (HPRA). To date, there have been no reports of falsified medicines being distributed through legitimate channels in Ireland, eight such cases were detected in the UK between 2011 and 2015 so the risk cannot be ignored. To tackle this threat, new EU legislation will require all prescription medicine packs to carry a special barcode containing a serial number and other details which will be used to check that the pack is legitimate. Before supplying the medicine to a patient, the pharmacist will scan the barcode to check the data against a central database managed by IMVO. If the pack details are not found in the database, an alert will be generated and an investigation will take place to find out if the pack is fake. These new requirements come into effect from February 2019 and pharmacists and pharmaceutical manufacturers and wholesalers, individually and through IMVO, are already working to ensure that all the necessary systems are in place by then. Pictured with Minister for Health, Simon Harris TD are a number of IMVO’s directors: from left Darragh O’Loughlin (IPU), Professor Pat O’Mahony, Chairperson IMVO, Jeffrey Walsh (Medicines for Ireland), Orlaith Brennan (IPHA) and Paul Reilly (PDF). The European Medicines Verification Organisation (EMVO) has released a new training video for pharmaceutical manufacturers and marketing authorisation holders to provide guidance on how to onboard to the EU Hub through the On-Boarding Partner Portal. 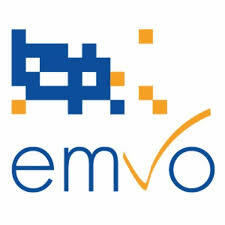 This video and other information are available on the onboarding section of the EMVO website.